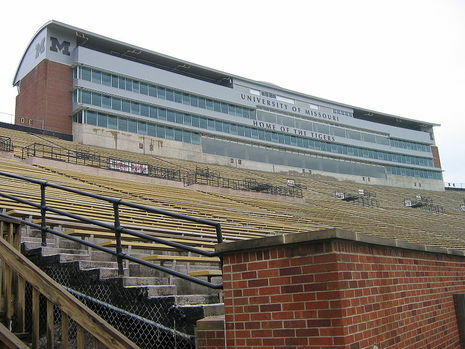 Faurot Field (pronounced /fɔˈroʊ/) at Memorial Stadium is the home field of the University of Missouri Tigers in Columbia, Missouri. It is primarily used for football. In 1972, Memorial Stadium's playing surface was named Faurot Field in honor of longtime coach Don Faurot. During the offseason, soccer goals are set up in the end zones and it is used for intramural matches. It also hosts the annual "Providence Bowl" game between Hickman and Rock Bridge high schools (so named because both schools are located on Providence Road in Columbia, and Faurot is roughly equidistant between the two) and in the past has been home to the MSHSAA football championships, now held in St. Louis (taking advantage of the climate-controlled atmosphere of the Edward Jones Dome). The Missouri Tigers athletics programs include the extramural and intramural sports teams of the University of Missouri, located in Columbia, Missouri, United States. The name comes from a band armed guards called the Missouri Tigers who, in 1864, protected Columbia from plundering Union squads as well as Confederate guerrillas during the Civil War. The University of Missouri (often referred to as Mizzou or MU) is the flagship institution of the University of Missouri System. The women's teams are sometimes called the Lady Tigers, but often both the men's and women's teams are simply called the Tigers. Mizzou is a member of the Big 12 Conference and is the only NCAA Football Bowl Subdivision program in Missouri.